“No other health problem that affects so many Americans has suffered from as much benign neglect and for so long as men’s health.” So begins Dialogue on Men’s Health, written by physicians and health experts from the Men’s Health Network which sponsors June’s national Men’s Health Month. Summit’s primary care physicians every day encounter a fundamental difference in the way most men and women view medical care and preventive health services. Women, by and large, consider regular physician visits as a part of everyday life. Many men, however, visit their doctor only when they feel they have to – either because symptoms have become unbearable or because someone in their family (often their spouse) has urged them to go. According to the U.S. Centers for Disease Control and Prevention, men die on average 5.6 years earlier than women. Men suffer higher death rates in nine of the top 10 causes of death, which include cardiovascular disease, cancer, diabetes and unintentional injuries. Men make half as many preventive care visits than do women (even after excluding pregnancy-related visits). The annual federal cost attributed to health disparities in men because of higher advanced disease costs and higher mortality rates: $142-$148 billion. So why do men seek health care services less frequently than women? Dialogue on Men’s Health outlines several reasons. Media and social messages about male body image, gender roles and masculinity contribute to the view that many men hold that health is a women’s issue. As boys, males are conditioned to think that sharing how they are feeling physically or emotionally is unmanly. Showing pain is unmanly, while playing or working while injured is masculine. Culturally, men are expected to “tough it out.” In addition, many advertisers believe that women make health purchasing decisions, so marketing is targeted to women. Several national and international organizations, including the Congressional Men’s Health Caucus, are working to reduce the disparity between men’s and women’s health, as well as change the social norms that are at its foundation. By getting regular physical exams, as well as the screenings appropriate for their age, men can take charge of their health, maximize health and longevity, and set an example for other men and boys in their lives. 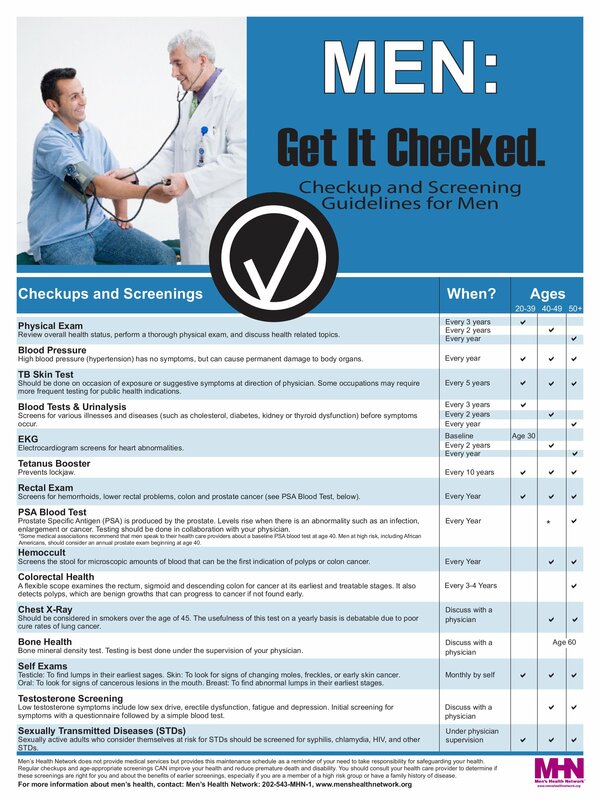 Click here to view the “Men: Get it Checked,” check-up and screening guidelines for men.